I arrived at fall camp my freshman year eager to learn the playbook and earn some playing time. During a practice two weeks into camp, however, I dove to make a play, and my hand hit a cleat. The impact felt awkward, and when I tried to perform my own amateur clinical test, I had a pretty good idea what had happened. I had broken my hand. I knew what was going on, but none of it was hitting me yet. I didn't feel any pain, and I certainly hadn't realized the implications of what would happen to my season until the staff told me that I needed surgery an hour later. That's when it became real. I was distraught. I felt that I had earned an opportunity to play and contribute to the team that year, and had really delved into the playbook to mentally prepare so that I could perform and help the team. Breaking my hand was a big punch to the gut. It was extremely tough to get through. I was down on myself until it clicked – let's just leave this in God's hands, keep working, and it'll all work out. Since then, that is exactly what has happened. I redshirted that year, and the following season, I started to see the field. I was playing decently as a backup cornerback, and then in the days leading up to our game against Washington State, the coaching staff told me I had earned a starting position. I remember the excitement that I felt calling my dad, the first person I told. It's his legacy that I carry when I have the “IV” next to my name, and I was thrilled to tell him the news. It's just a different experience from merely being in the rotation to when the first play is snapping off and you're the one out there. I knew it was going to be a sweet feeling, but my first test was going to be a difficult one. 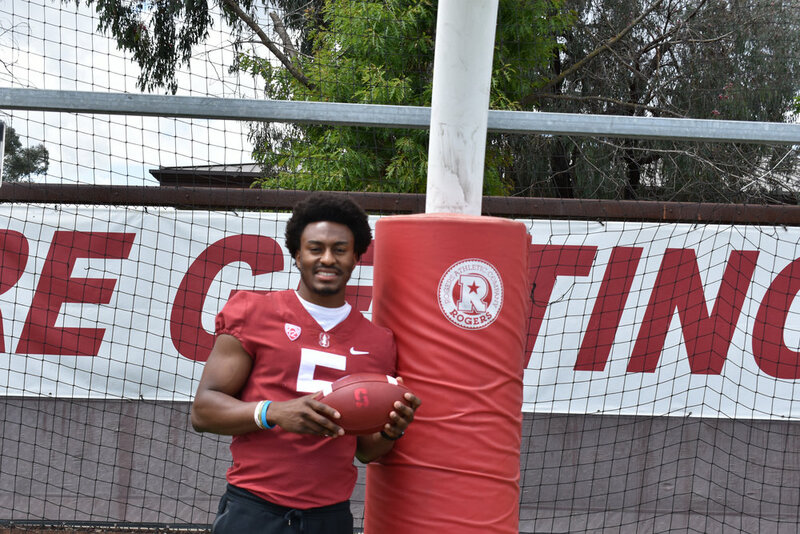 The first quarterback I would face as a starter was none other than Luke Falk, the player who would eventually throw for more yards and touchdowns than any other player in Pac-12 history. Falk lived up to the billing and played a great game, but on one opportune play I saw the ball sailing right toward me. Instinctively, I reached up and snatched it, and just like that, I had my first career interception. But I wasn't settling for the interception – I was going for the end zone. I made a dash for the right corner, and the only man left to beat was Falk himself. He sprinted for the pylon too, but I was able to get my body to hesitate just long enough to let him brush by. The end zone and the touchdown were mine. That momentum carried into last year, when I went through a position change right before the season. The coaching staff decided to put me at safety, a position I had never played before. While, I initially felt lost, I eventually regained my confidence through dedicated practice and film study. I finished 2017 with 46 tackles, a forced fumble, a fumble recovery, and three interceptions. Perhaps just as importantly for me, I made the Pac-12 All-Academic team for the second year in a row. Now as a redshirt junior, I'm setting my sights much higher. After all, I've got a legacy to live up to. You see, when I sign my name, I intentionally decide to put in the “IV,” denoting that I am the fourth in an honorable legacy of strong men. I don't have to do it, but I choose to honor the name that the three generations of men before me have built. My grandfather, specifically, set a powerful example of how to do things the right way. Frank Buncom II didn't just make it to the NFL. He was amazing once he got there. He was an AFL champion, a three-time All-Star, and when the Chargers opened their Hall of Fame, he was named to their inaugural class of four. He was a great football player. But he was also a great man. He treated everybody with respect, regardless of their stature. My grandpa made such an impact on the Chargers ball boy, Buzz Ponce, that 44 years after my grandpa’s death, Buzz wrote a book about him. That book is in my dorm room today, and it reminds me that no athlete or person is too big or too important. He taught me that nobody is above anybody else. That's why when I get one of my first big paychecks, I plan to buy a nice house for my second parents, Trina and Alfredo – two people key to shaping my childhood and who I have become as a man. They helped raise me four or five days a week when I was younger and my parents were both working. Trina has an even longer connection with my family. Her parents helped raise my dad. So yes, I will definitely be treating my parents when I get that paycheck, but I'll also be taking care of Trina and Alfredo too. The only question is how big of a house should I buy them with that football check.